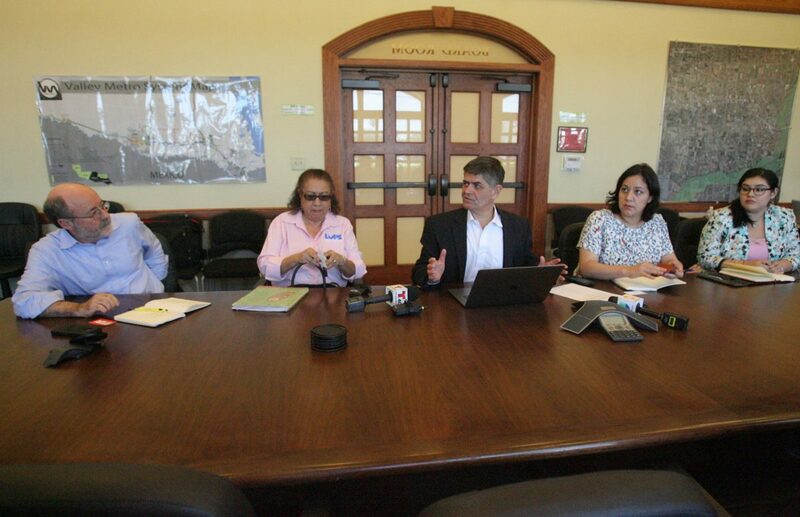 ACLU Border Advocacy Strategist, Michael Seifert, along with Juanita Valdez-Cox of L.U.P.E, US Rep., Filemon Vela, Rochelle Garza, an attorney from Brownsville and Amber Arriaga with Projecto Azteca Equal Voice Network during a round table discussion of the "no tolerance" at the Lower Rio Grande Development Council in Weslaco Wednesday, May 30, 2018. WESLACO — As the Trump Administration’s “zero tolerance” immigration policy continues to be enforced prominently in the Rio Grande Valley, a Wednesday roundtable conversation here led by U.S. Rep. Filemon Vela described scenes of young immigrants screaming as federal authorities separate them from their parents inside South Texas detention facilities. The administration announced earlier this month that it would dramatically ramp up the zero tolerance policy, which is intended to deter new immigrants with threats of jail sentences and separating immigrant children from their parents. Rochelle Mercedes Garza, a Brownsville immigration attorney, said immigration is not a criminal action. Garza joined Vela, D-Brownsville, Michael Seifert, a border advocacy strategist for the American Civil Liberties Union, Juanita Valdez-Cox, director for the advocacy group La Unión del Pueblo Entero, and Amber Arriaga-Salinas from Proyecto Azteca for Wednesday’s discussion. Vela said he organized the conversation as Trump’s “zero tolerance” has swamped the federal courts in Brownsville and McAllen, something that hadn’t happened until recently. In separating families, immigrant adults head to federal courthouses while children are resettled under the Department of Health and Human Services. The New York Times reported that 700 children were separated from their parents between October 2017 and April. 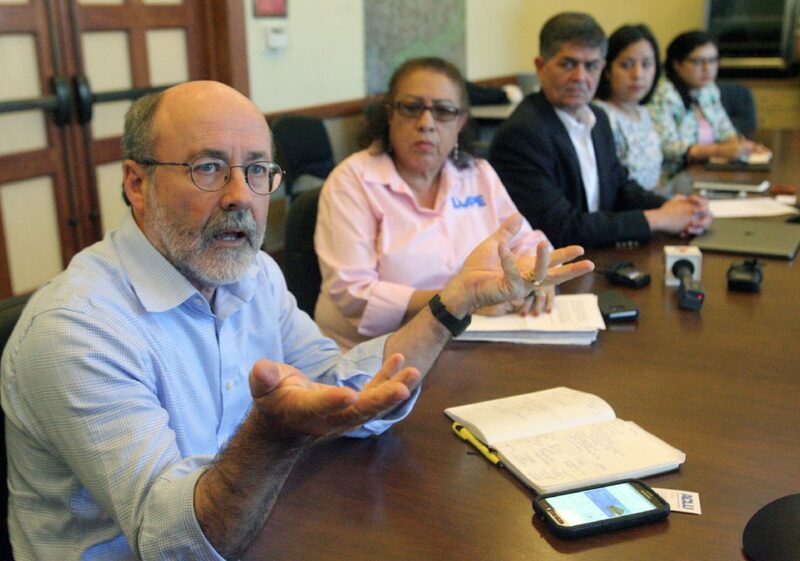 Vela said from May 6 to May 19, 658 children were separated from their parents. The roundtable participants, who said they’ve struggled to get information from Homeland Security and HHS on these issues, predicted that 658 number will increase. Sticking by that projection, federal authorities are planning to resurrect the “tent city” in Donna, according to Vela. U.S. Customs and Border Protection constructed this makeshift facility to temporarily house apprehended immigrants in December 2016. This facility, which no longer exists, held up to 500 people and provided housing, beds, toilets and bathing facilities as needed. Immigrants were held temporarily under CBP custody until they were transferred to U.S. Immigration and Customs Enforcement for processing, detention or removal; or to HHS. Then, however, families were not being separated. Currently, the process is muddy, the round table participants said. They said they’ve heard stories, upon apprehension by Border Patrol or CBP, of authorities placing immigrant children in one van and parents in another. Other times, they said, immigrants will be taken to a detention center where authorities then separate the families. The children are eventually handed over to the Office of Refugee Resettlement, Garza said, an office within HHS. The Washington Post reported Wednesday that more immigrant children are being placed in long-term foster care, sometimes hundreds of miles from their jailed parents. Those parents are eventually brought to a federal court, where magistrate judges have had swamped dockets. The round table participants said they don’t know what the age limit is to separate a child from a parent, nor do they know how long between apprehension. Over the weekend, Trump took to Twitter and blamed Democrats for family separations. Sessions announced the zero tolerance policy last month. “He’s the one separating the families,” Vela said. Seifert explained how he has witnessed this separation over and over recently. Garza said the courts will not be able to sustain this influx, which Vela linked to the 2014 immigration surge.